Who’s afraid of the monster in the closet? Not my Luke! He recently received a ScareMeNot plush monster toy for review and has had a ball playing with “Knock-Out-Ned” day and night. Knock-Out-Ned is special because he has a boxing glove to knock out any scary monsters that might come along and try to frighten Luke at night. He also has plenty of eyeballs – 3 on each foot, one big one on his hand, and the huge one on his face. Nothing gets by Knock-Out-Ned! His super long tail has special velcro so that he can hang pretty much anywhere. 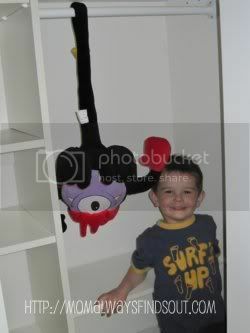 We have him hanging on the closet rod in the photo. You could also hang him from the door knob. Or, if you are like Luke and just want to cuddle with your soft, snuggly ScareMeNot monster friend, no problem. He’ll sleep in your bed and protect you there too. The Good Little Monsters known as ScareMeNots are specially trained to keep watch for “bedtime scaries” so your child can get a good night’s sleep. All ScareMeNots get their training at the ScareMeNot Academy where they learn to see in the dark, hang from their tails, and stay awake all night. When they graduate, ScareMeNots are sent to bedrooms everywhere to help kids feel protected at bedtime. Would your child like a ScareMeNot? View the entire collection at the ScareMeNot website. There is a variety of monsters, including girls and boys, as well as having full size ($24.99) and travel size ($14.99) options. There is currently a promotion going on so that when you buy the full-size Valiant Valerie, you get the travel size Valiant Valerie FREE! Connect with ScareMeNot on Facebook and Twitter. WIN your choice of ScareMeNot here at Mom Always Finds Out! Enter to win the giveaway between now and June 12 at 11:59pm PST. Open to USA residents ages 18 and up. MANDATORY ENTRY: Visit the ScareMeNot website and leave a comment here telling me which monster you would choose. *Follow Mom Always Finds Out on Google Friend Connect (right sidebar). *Like ScareMeNot on Facebook (link can be found above). *Follow ScareMeNot on Twitter (link can be found above). *Like Mom Always Finds Out on Facebook. *Follow Mom Always Finds Out on Twitter. Disclaimer: I was provided a Scare­­­-Me-Not monster in exchange for this written review/giveaway post. All opinions expressed are honest and my own, based on personal experiences with this product. “Defender Dave” would be my choice. I like the smile and the way his arms look like they’re ready to give a hug. “Like” Scare Me Not on Facebook at http://facebook.com/mimi2tnb. Following Scare Me Not on Twitter @oneinpurpose. I “Like” you on Facebook at http://facebook.com/mimi2tnb. I follow you on Twitter @oneinpurpose. Love Fearless Fred and Courageous Carries. I visited the website and I would choose Watchdog Wally. I am following Mom Always Finds Out via Google Friend Connect. I Like ScareMeNot on Facebook. Deep-breath Dudley is my hero!! Courageous Carrie is so cute. Deep Breath Dudley is also cute though. I wish my daughter were here so she could look and see what she likes. lOl. Like Scare Me Not on FB as well. I’d choose Deep Breath Dudley. I like the protector patty. I would pick Guardian Gus. Such a great idea!! I think I would choose Watchdog Wally. I would choose KnockOut Ned! So cute and clever! I love Courageous Carrie! I like ScareMeNot on facebook as Hannah Rae. I follow ScareMeNot on twitter as hgardner16. I like Mom Always Finds Out on facebook as Hannah Rae. I follow Mom Always Finds Out on twitter as hgardner16. Shared on FB- Candace Flamm. I am following Scaremenot on fb under Kristina E.
I am following Scaremenot on twitter under the name racingandsaving. I am following you facebook. I am following you twitter as racingandsaving. I would choose Courageous Carrie. I liked Mom Always Finds Out on FB. I follow Mom Always Finds Out on Twitter. I would choose protector patty. I like Deep Breath Dudley. I would choose Fearless Fred. Like Mom Always Finds Out on Facebook. Aw= Guardian Gus is so cute! I follow Scare Me Nots on FB as Karhma Dent. My three year old could realy use ,defender dave,he is scared that there is monsters in his room so this would help him. followed on google friend connect. I Shared on FB – Candace Flamm. Protector Patty or Watchdog Wally! And shared on FB today too.